Image caption The park is Navya Singh's "favourite place"
A seven-year-old Indian schoolgirl who had petitioned the court and Prime Minister Narendra Modi to save her neighbourhood park has won her fight. Navya Singh had been seeking to stop local authorities from building a community centre in her local park in the Indian capital, Delhi. The authorities on Friday told the court that they had decided to shift the location of the proposed centre. Navya told the BBC she was celebrating the victory with her friends. 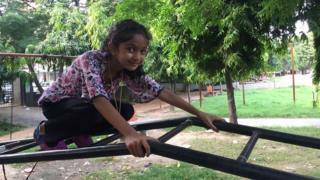 The schoolgirl says the park, which is just a few minutes' walk from her home in the crowded Rohini area in west Delhi, is her "favourite place" and she goes there "every morning and evening" to play, writes the BBC's Geeta Pandey in Delhi. Residents of the area say large parts of the park have been encroached upon over the years so the space for children to play has been constantly shrinking, our correspondent adds. In June, the Delhi Development Authority (DDA), which manages the park, cordoned off nearly one-third of the area and began construction of the community centre. When the unhappy residents, including a large number of women, protested in front of the park, the DDA called the police and took over possession of the area. From 26 June, Navya and other residents had no access to the park - it was barricaded, heavy machinery was brought in and huge iron pillars were installed. In August she filed a petition in the Delhi high court through her lawyer father and also wrote an open letter to the prime minister to save her park. The petition said the project was "a waste of public money" as a community hall already existed "just 50 metres" from the site of the proposed new one. The court had ordered the DDA to halt all building work at the park while the case was being heard. Delhi has more than 14,000 public parks and open spaces: some are managed by the civic authorities, some by the city government, and others by the Delhi Development Authority. Although many of them are poorly maintained, in densely populated city areas, they are popular hangout zones where children play, adults get some exercise and the elderly socialise.